If you hold Star Wars close to your heart, why not do so literally with our selection of Star Wars necklaces and pendants? From sterling silver Galactic Empire necklaces to fun, colored enamel BB-8 pendants, we have it all. Our Star Wars necklaces and pendants category spans the different eras of Star Wars, from the original trilogy starting with A New Hope all the way to The Force Awakens, The Last Jedi, and beyond. Shop sterling silver droid necklaces as well as First Order pendant necklaces, Stormtrooper dogtags, and more. We carry gunmetal Galactic Empire pendants as well as cubic zirconia-embellished Star Wars jewelry for an extra touch of glam. Shop Darth Vader helmet pendants, Millennium Falcon necklaces, and even jewelry from the Jedi Order. Since their debut in 1977, the Imperial soldiers of the Galactic Empire never fail to draw the eye. 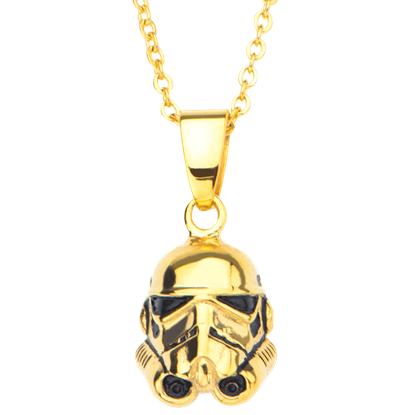 Modeled after the helms worn in the original trilogy, the 3D Stormtrooper Gold Necklace is a trendy accessory for Star Wars fans. 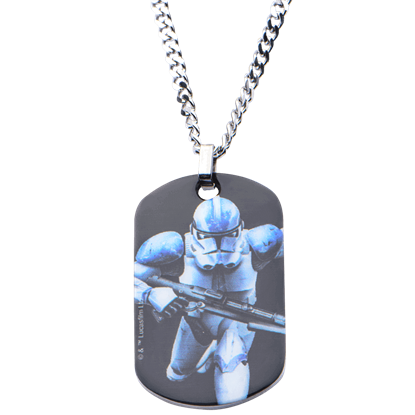 Charge into battle and make the Vader proud with the Action Clone Trooper Dog Tag. This officially licensed Star Wars necklace features a trooper illustration on the front of the pendant and a Galactic Republic emblem on the back. The All-Terrain Armored Transport is one of the most impressive assets of the Galactic Empire. 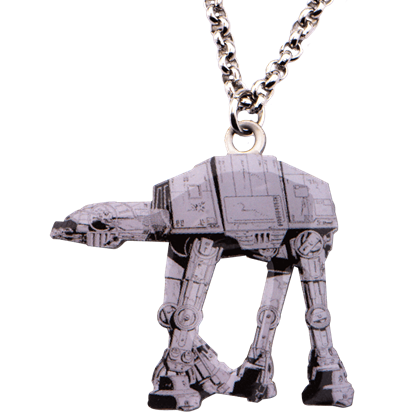 A real AT-AT is sadly too big for most garages, but the AT-AT Graphic Necklace shrinks the vehicle down to ideal accessory size. 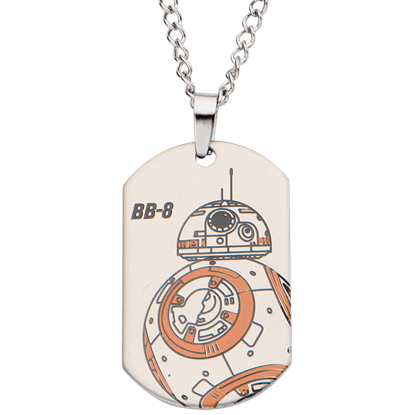 Take BB-8 along on all your space adventures when you wear the BB-8 Dog Tag Necklace. This officially licensed Star Wars jewelry piece features a colorful and detailed depiction of the Episode 7 astromech droid hero on its pendant. Let Poe Damerons adorable droid be your constant companion with the BB-8 Enamel Pendant Necklace. 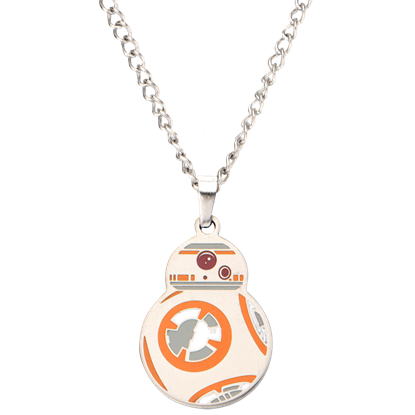 This officially licensed jewelry piece features the orange details of BB-8 decorating an enamel pendant on a stainless steel chain. 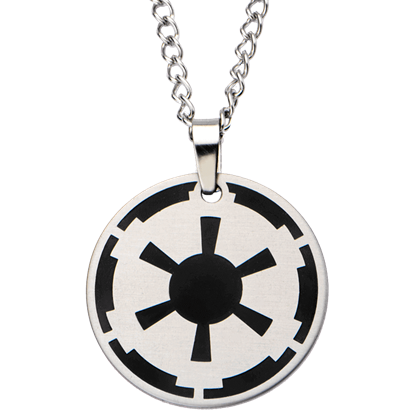 Proudly sport your allegiance to the Empire when you wear the Black Galactic Empire Steel Enamel Necklace. This licensed Star Wars accessory features a round, stainless steel pendant decorated with the iconic Star Wars symbol. 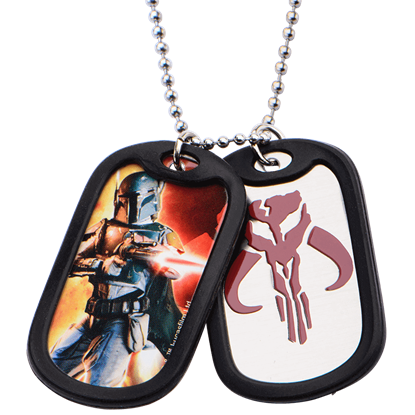 For style as deadly as the iconic Star Wars bounty hunter himself, adorn yourself with the Boba Fett Double Dog Tag Necklace. 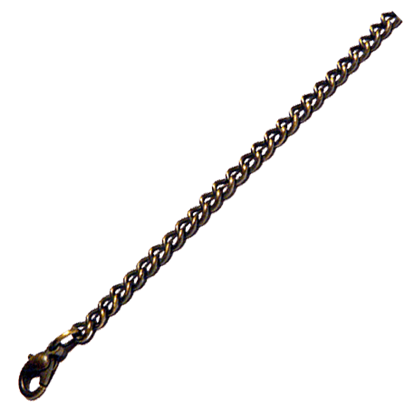 This officially licensed Star Wars jewelry piece features two dog tags strung on its ball chain necklace. 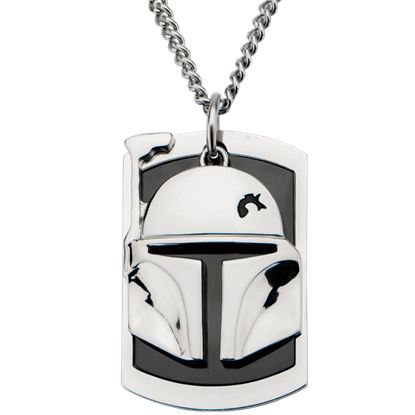 The Boba Fett Helmet Dog Tag Necklace is an officially licensed accessory fit for even the most expert Mandalorian mercenary. This stainless steel Star Wars necklace features a dog tag pendant accompanied by a Boba Fett helmet charm. An infamous galactic bounty hunter and the cloned son of Jango Fett, Boba Fett is a Star Wars fan favorite. 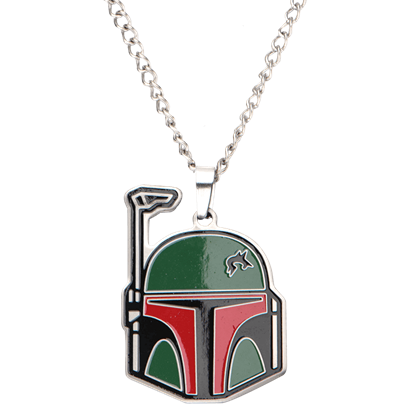 Show off your love for this deadly Mandalorian when you wear the officially licensed Boba Fett Helmet Enamel Necklace. 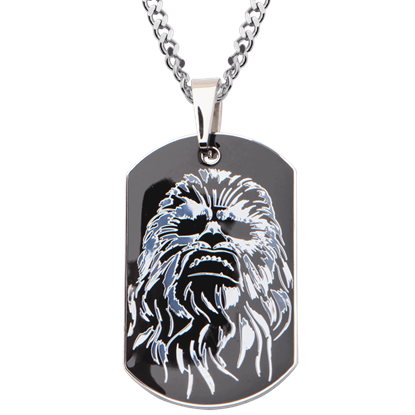 The Chewbacca Dog Tag Necklace depicts the furry face of Chewie, immortalized in a fearsome Wookiee roar, on its stainless steel pendant. On a black background, the details of the design are revealed with sleek contrasting lines. The strength of an angered Wookiee is a nigh unstoppable force throughout the Star Wars galaxy. 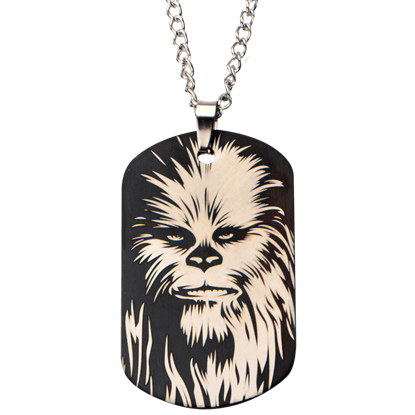 Show the world you are likewise not to be messed with when you wear the officially licensed Chewbacca Stainless Steel Dog Tag Necklace.